Grupo Vidanta has had a presence in Latin America for over 35 years. Having established numerous award winning resort brands, our goal is smart investment that leads to the ultimate satisfaction of not only Grupo Vidanta investors, but also the thousands of customers which we serve. From family friendly resorts that are all-encompassing and provide everything for the discerning vacationer to the ultimate in luxury accommodation for the high-class, elite traveller, Grupo Vidanta resorts have been setting the trends for decades. Today, we’re represented on many of the main tourist beaches in Mexico in locations such as Acapulco, Mazatlan and Los Cabos to name but a few. Over the years, the Grupo Vidanta brand has become associated with high quality, luxury vacations that cater to just about everybody. Also well known for our award winning golf courses, the Grupo Vidanta brand has become known as the largest golf course operator in Mexico. 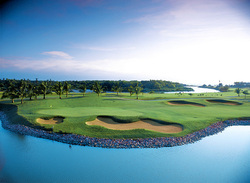 With many of our courses situated right next to our superb resorts, our guests can enjoy playing at courses that are designed by Jack Nicklaus design – regarded as the industry standard when it comes to high quality, world-leading golf courses. Grupo Vidanta is constantly expanding and aside from our stunning resorts and golf clubs collection, we have interests in real estate development, and we’re also proud to own the only International private airport in Mexico. With 30 years of investing in Mexico, Grupo Vidanta has numerous brands which all represent our core values of Integrity, Quality, Passion and Creativity. We’re committed towards ensuring our resorts are cutting edge and that our guests and employees all experience the joy and happiness of everything we’ve accomplished at Grupo Vidanta.